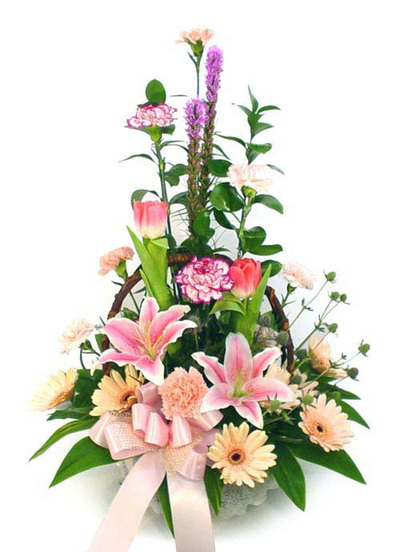 Celebrate big, billowing flowers with an exuberant large-scale arrangement. 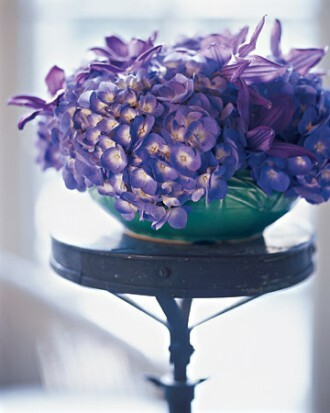 This display showcases the unrestrained beauty of hydrangeas. 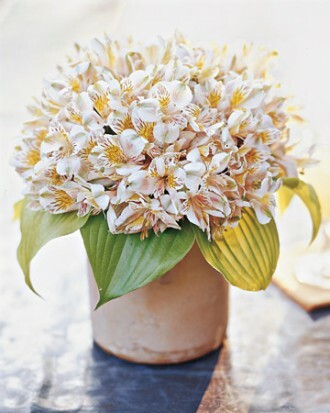 An armful of the flowers overflows a generous glazed-iron urn-shaped vase in an effortlessly elegant way. Tendrils of clematis winding through the blooms emphasize the cottage-garden feeling. 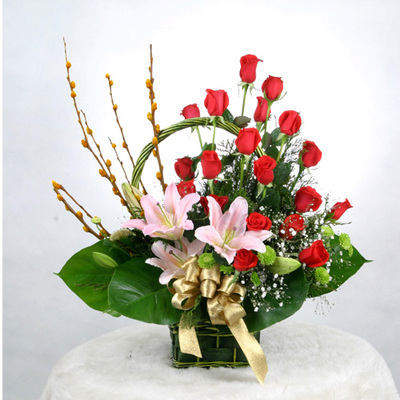 The woody stems are left long and anchored in a two-tier wire flower frog, which is secured to the bottom of the vase with dots of floral adhesive. Make a jewel-like bouquet by combing unexpected elements. 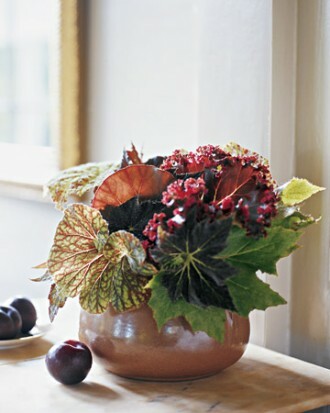 An assemblage of begonia leaves snipped from houseplants invites a closer look and rewards the viewer with varied colors, patterns, and textures. The rich shades of red and green blend beautifully with the caramel-colored Mission vase. 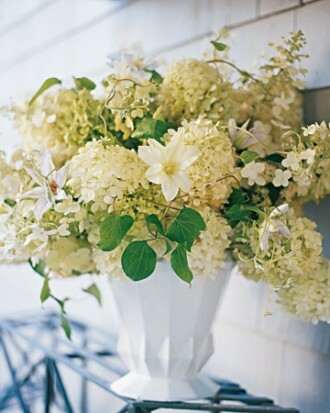 Let long stems arch out of a trumpet vase for an ethereal arrangement. Flower stems naturally follow the shape of this vase: They reach up and out, and the result is delicate and light. 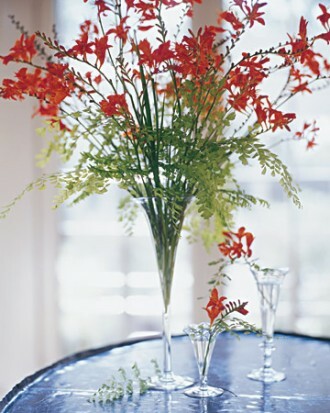 Choose flowers with graceful stems, such as this crocosmia, for the most pleasing look. Shorter cuttings of maidenhair fern float beneath the blooms. Echo the idea with smaller vessels -- parfait glasses work perfectly -- holding just a few stems. 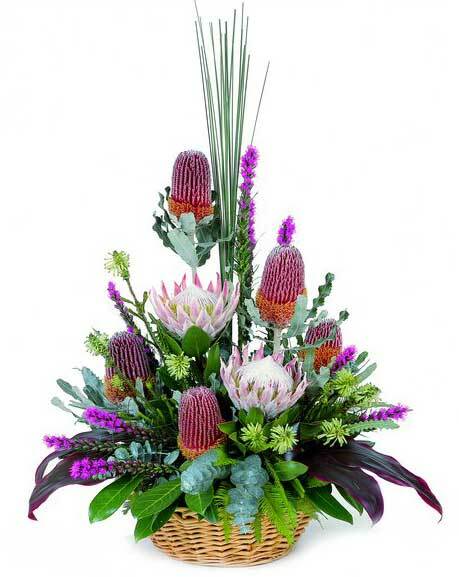 Play with texture by adding airy sprigs to a dense mound of flowers. 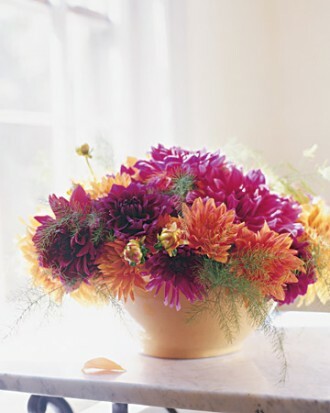 A yellowware kitchen bowl of late-summer dahlias would certainly be lovely enough on its own, but adding a contrasting element -- here, wispy asparagus fronds -- make the hot colors and spiky forms even more striking. A grid of clear cellophane tape spanning the wide mouth of the bowl supports the top-heavy flowers better than a frog would. 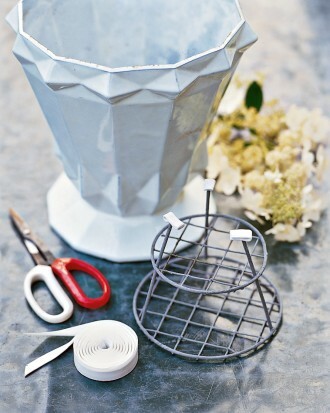 Cut the stems short, and insert one or two flowers in each opening in the grid. Tuck fern clippings in last. Create a study in color with different flowers in shades of the same hue. Hydrangeas and clematis in purple tones look unified yet diverse. The aqua-colored McCoy bowl peeking out is a bright surprise. To support the stems in the low container, a frog is essential. A spiked one is good for the hydrangeas' woody stems; bits of floral adhesive on the bottom of the frog keep it from shifting and scratching the pottery. The little flowers were first bundled in a single bouquet bound with rubber bands, then fit into the French ceramic pot; the leaves were tucked in afterward.